An album that captures a feeling, more even a place and a time is a rare thing. Concepts albums are a dime a dozen, and many come out of a quirky desire to make something genre/literature based or a rock opera. In the last few years we have been graced with the deeply effecting Songs In A & E by Spiritualized and then The Decemberists sad, but raucous The Hazards of Love. Both presented emotion and sadness through deep instrumentation and solid lyrics, yet both also had a vested interest in a bright side. For Spiritualized, an album written while song writer Jason Pierce was recovering from a near death experience in the hospital finds a sense of gratitude for life. For The Decemberists love is dangerous, but ultimately worth dying for as the two lovers drown in each others arms at the end, happy that they have each other for eternity. 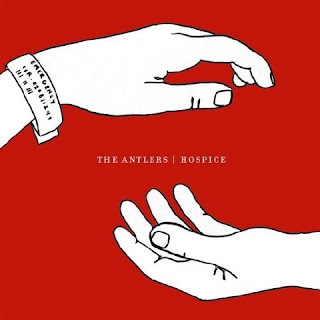 The Antlers sophomore album Hospice operates on the other end of the spectrum. The album holds death and destruction close and doesn't try to reconcile any lesson from it, other than that death happens and the tragedy resonates. Hospice opens with the droning echo of empty hallways, and the feeling that the listener is being led somewhere they do not, or will not, like. I have been fortunate in my life not to spend a lot of time in hospitals, surrounded by mortality and the sterile maintenance of illness and death, but I have dear friends who have and what is described feels like the opening. It's a nightmare. And this album is about a nightmare: a man losing a loved one, Sylvia to cancer. After the opening track, the droning walls of sound continue, sometimes sounding like cicadas roaring in summertime in their unsettling, alien way. While some tracks take a more poppy course than others the whole of it is clattering and disheveling. The album makes you feel death and doubt and fear and regret. It's rattling. And even more rattling are Peter Silberman's vocals that feel hollow, tired and pleading. His strained words and notes capture and reflect a man who doesn't sleep, who is at the end of his proverbial rope. This is a man losing his love, and feeling powerless. There is no containing or skirting death in Hospice, no matter how many times sleep and dreams try to tell us otherwise. Cancer, and death, and watching the end of a person, slowly wasting away is a combination of dreams and nightmares. The silence of being in the real world is more frightening than anything the subconscious could create. There are up points in the album, reminiscent of Arcade Fire in instrumentation and vocalization, but never so wistful and hopeful. Hospice reminds me of a story from a book I reviewed for this blog previously. In Richard Yates' Eleven Kinds of Loneliness there is a story called "No Pain Whatsoever" about a wife visiting her husband in the tuberculosis ward. The silences between the husband and wife are more powerful than their pleasantries and consolations to one another that the situation will be okay. They both know that he won't be healthy soon, if ever, and yet they must pretend that the life they knew with each other still exists and will continue as originally planned eventually. It's only a matter of time. But, it's not. The wife knows as she leaves the ward that her husband, the man she loved and married is essentially dead. And the husband knows that he'll never be the man she fell in love with again. They dance the dance anyway, and talk the talk, because the pain of confronting the real end of things is far more intimidating than the horror of maintaining airs. Hospice accepts that nothing can be done, and yet it does exist in a way to keep a moment, the moment before Sylvia has died, in limbo, thus bestowing her with an immortality. Every time the album is played she is alive again, if in perpetual suffering, but she is not completely gone. Suddenly every machine stopped at once, and the monitors beeped the last time. Hundreds of thousands of hospital beds, and all of them empty but mine. The song progresses, from the perspective of the now dead Sylvia, as the man comes back and leaves his ring in her hand and tears the visitor's band off of his wrist. It's a horrible, and tragic and real death, and there is no way to interpret it otherwise. Moments like these are not easy to pass from person to person. Explaining why a song or book or poem makes you feel a way in your own personal context is often unclear to other people. We don't understand the precise feelings in each other during break ups, or loss of loved ones, or lost jobs or anything. But this album gives you the feelings of emptiness and loss that come with death. And illness. And the quiet sadness that comes from a hollow pit inside that laughter cannot replace and new love can't refill. Even in dreams, as illustrated by the lyrically tragic, haunting final track "Epilogue." Now, given all things considered in this review, the album is so amazing that it is worth the pain of hearing it and letting it well up the feelings it will. Hospice is a beautifully orchestrated, forcefully written piece of modern musical genius.